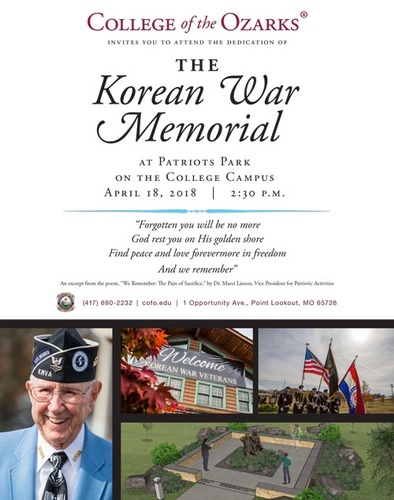 The College of the Ozarks invites you to attend the dedication of the Korean War memorial at Patriots Park on the College Campus. "Forgotton you will be no more, God rest you on His golden shore, find peach and love forevermore in freedom and we remember." An excerpt from the poem, "We Remember: The Pain of Sacrifice," By Dr. Marci Linson, Vice President for Patriotic Actitives.